The Perkins Discovery Fund is an actively managed micro-cap portfolio that can be appropriate for individuals, retirement accounts, college accounts, and other investment accounts or portions of an account with an aggressive investment objective. The Perkins Discovery Fund seeks capital appreciation through investment primarily in common stocks, but has the ability to invest in other types of securities or maintain cash positions when warranted. 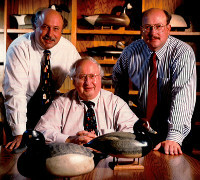 Richard C. Perkins, Richard W. Perkins and Daniel S. Perkins are co-managers of The Perkins Discovery Fund.